I’ve had the pleasure of getting my hands on a majority of the social selling technologies in the space. Of the many tools available, I’ve handpicked five of them to share today. Each of these technologies make sales teams more efficient and create ROI over time, while focusing on different problems in the sales process. Despite having some overlapping features and benefits, they do not compete with each other because of their specific problem-solving capabilities. These are the ones to watch out for. KiteDesk 2.0 was just released last week. I was one of a handful who were offered an early look. One thing that truly intrigues me about KiteDesk is the simple fact that the technology allows you to find contacts on any web page and, in a single click, import their contact data into the CRM. KiteDesk seamlessly pulls clean data from Fliptop, Netprospex, ZoomInfo and Full Contact. The UI is super clean, and it is extremely easy to navigate. It is a great solution for small to midsize companies from 5–500 employees. 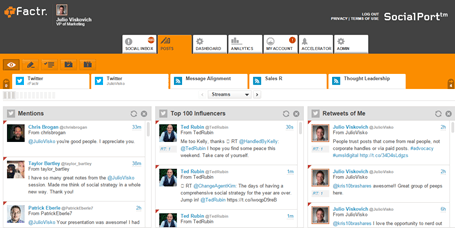 rFactr is one of the only true “social selling” platforms geared solely towards social selling sales teams. This technology is fairly simple to use and is key to getting your sales team to share the right content, at the right time, to the right person with one simple click on a link. Marketing can set up content and send it as an email to the sales team, which can click a link inside the email and post it to their social channels within minutes. The company just did a partnership with Forbes and is adding new features monthly. They mainly play in the enterprise space, but I don’t see why mid-market or smaller companies couldn’t get value out of the solution. Increase in engagement—right message, right person, at the right time! InsightPool is already known in the social media marketing space as one of the top platforms for social drip campaigns. They just acquired another company and now have a solution focused strictly toward sales. Their UI is super clean! In a nutshell, the platform focuses on finding targeted prospects, customizing engagement, and tracking dollars and cents related to social engagement and deals closed. They practice what they preach and leverage their own platform to engage. Add them on Twitter, and you will see what I mean. 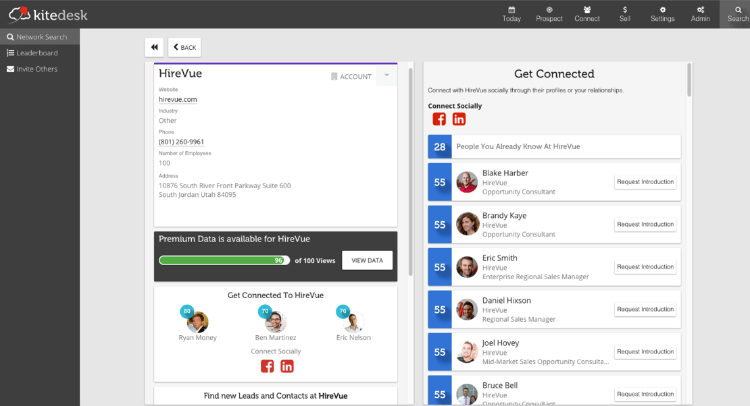 Nimble, in my opinion, is the future of what CRMs will look like for most companies in the next two years. It is super easy to navigate and allows you to pull data in from any social profile within seconds. Not only can you pull in the data from the social profile you are searching in, but you can also pull data from all of a contact’s social channels into one lead record. 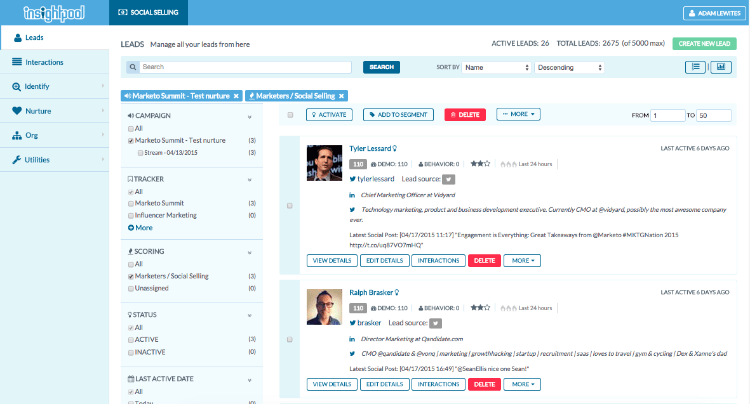 It streamlines the manual process of searching different social profiles and inputting data into CRM. It also tracks all of the social engagements within the contact record as well. 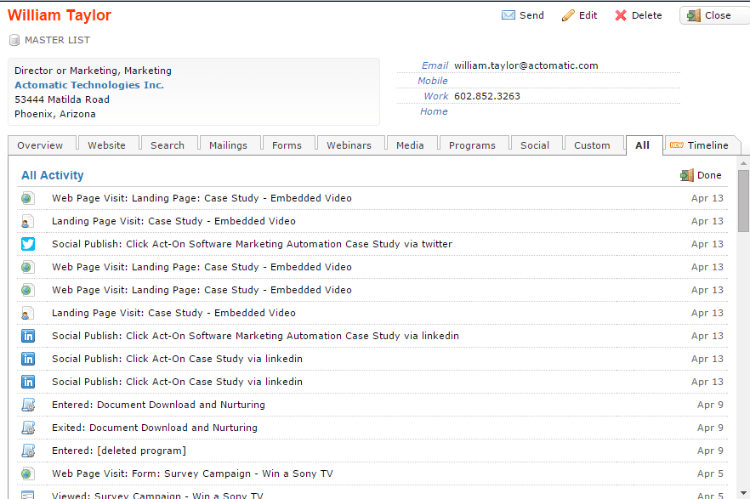 You can see the lead contact history within the social profile, instead of having to into the CRM. 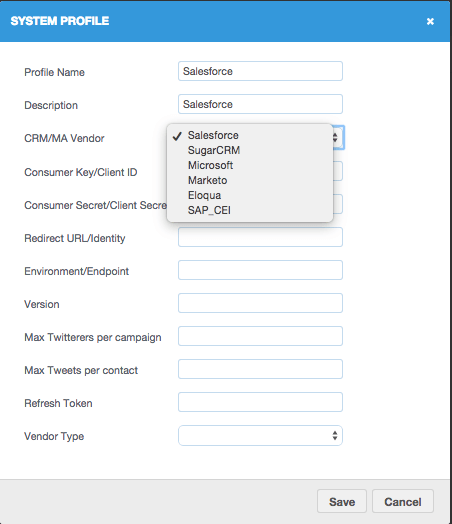 Nimble integrates with Salesforce as well, which allows you to push all the data into the Salesforce when you’re done. This solution is targeted more towards small–midsize companies but could be used at the enterprise level. Social selling is a continuum. You begin by creating and fostering a relationship online, and at some point, it has to go offline. This is a chasm a lot of sales reps just can’t seem to cross. Marketing automation is crucial for social selling because it gives visibility into all behaviors of a prospect once the conversation goes offline. These behaviors include website page visits, landing pages, social media assets, and a lot more. Social selling is a soft art/science which involves more time on the front end to build the relationship and discover a need before going straight into a targeted sales process. Marketing automation allows sales reps to get a real-time pulse and automate email to educate the prospect and keep them engaged based on what is important to them. This nurturing is essential for having sales success. The channels you use to develop a lasting relationship with a prospect shift, but the point is to use the appropriate technology to help you generate and grow the relationship throughout the lifetime of your customer. 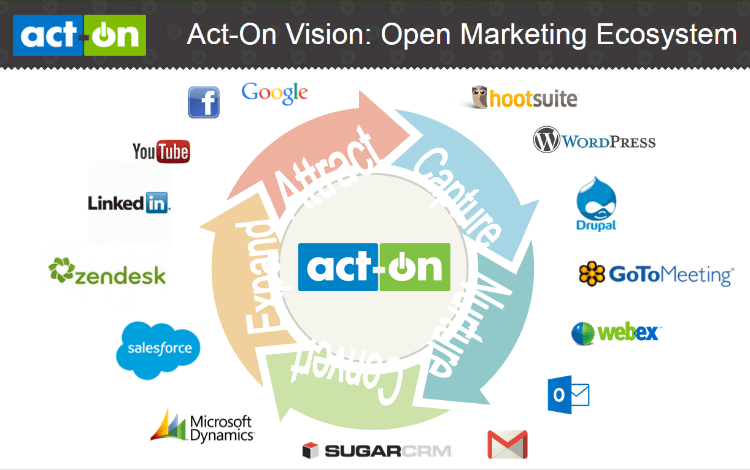 I recommend Act-On Software for marketing automation. Full disclosure: I work for Act-On, so I’m admittedly biased. 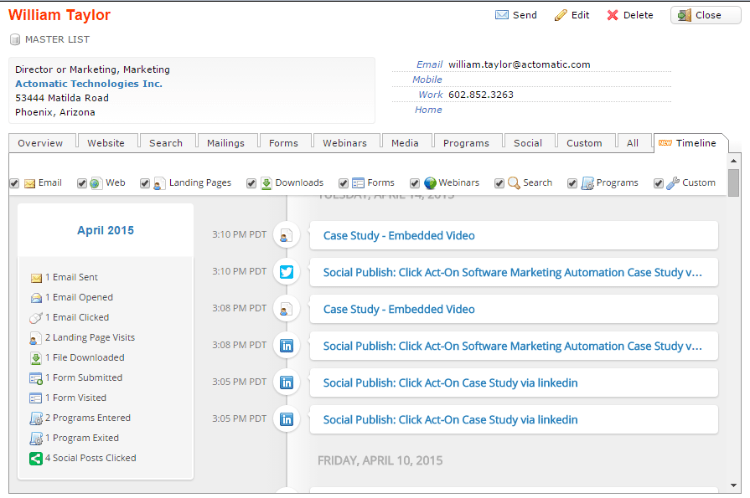 But we’ve just released a feature that’s a game changer for anyone practicing social selling. 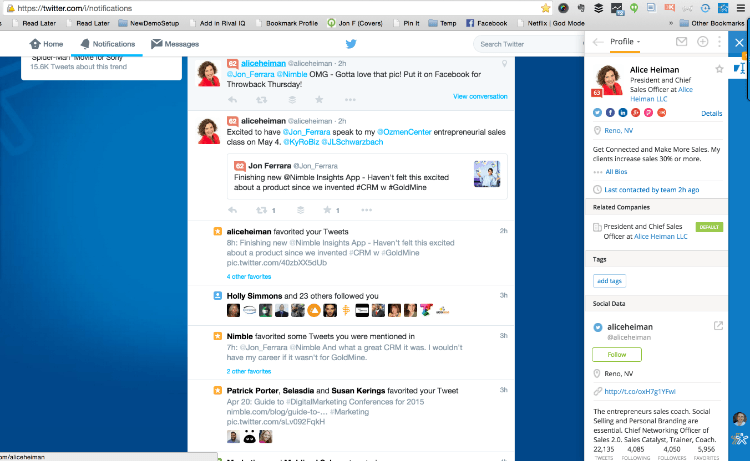 Act-On Anywhere is a Chrome browser icon that lets sales reps see the real time “activity history” of any contact in real time within any of the social media platforms. For example, say you’re reviewing someone’s profile on LinkedIn. Click Act-On anywhere, and if that person has a history with Act-On, you’ll see it all. 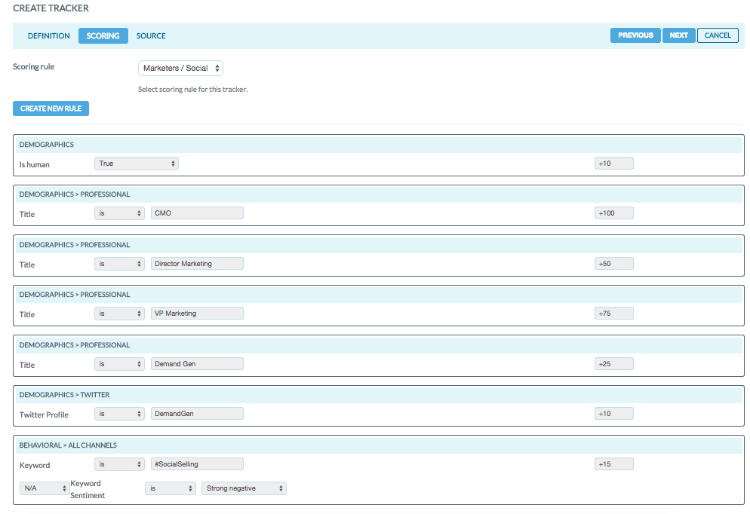 This eliminates the process of going back into the CRM. 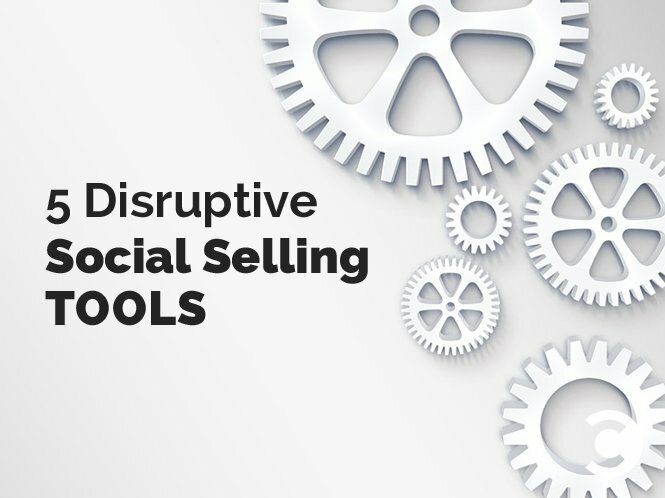 All of these solutions fix different problems in the social selling sales process. Make sure you assess where your gaps are first before buying any new technologies. Look at the process, and then align the solution that will be the best to fix your process. Happy social selling! 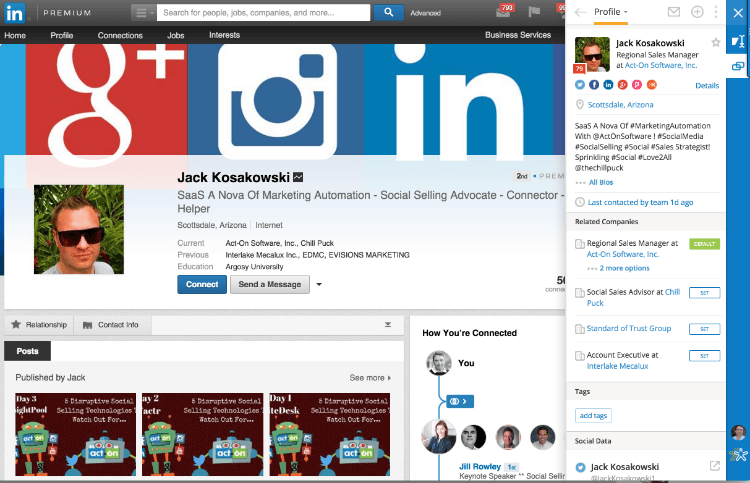 Jack Is known as the "SaaSaNova" of marketing automation in his social networks. He is a passionate practitioner and proselytizer in the social selling space, which is apparent in all of the content he has published on LinkedIn, Business2Community and Act-On Software's blog. He is the Regional Sales Manager at Act-On software and a graduate of NAU.